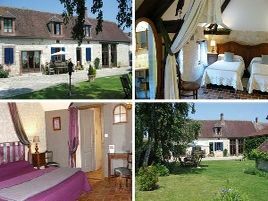 Situated to the north of Burgundy, near the Auxerre and Chablis vineyards, in green and leafy grounds, La Métairie is a traditional 18th century stone longère, completely renovated. The rooms are self-contained, spacious and comfortable. Antique furniture, exposed beams and old tiled floors create a cosy, calm atmosphere. Delicious breakfasts with a variety of breads, homemade jams and pastries, local dairy produce, eggs, fruit. Warm, attentive yet discreet welcome..
- une belle halte pour découvrir les vignobles bourguignons : Irancy, Coulanges, Chablis, St-Bris, Chitry, Epineuil, Joigny - golf au Domaine du Roncenay à Chassy, 8 km. 3 rooms with bath or shower and WC. From 70 to 80 euros (1 pers. ), 85 to 100 euros (2 pers.). Extra bed 25 to 40 euros. PR sur place, GR 13 à 500 m, prêt de cartes ou topo-guides, transport des bagages vers l’hébergement suivant (gratuit jusqu'à 15 km, 10 euros si plus loin), collation à l’arrivée, location d’ânes à proximité. AUTRE : à disposition cuisine d'été, frigo, barbecue (gratuit), lave-linge et/ou sèche-linge 5 euros.